Prior to this year's edition of the Stockholm Furniture Fair, Gunnel Svensson at Bsweden has started a collaboration with the renowned artist Anna Berglund. Together, they have created two new luminaires for Bsweden. 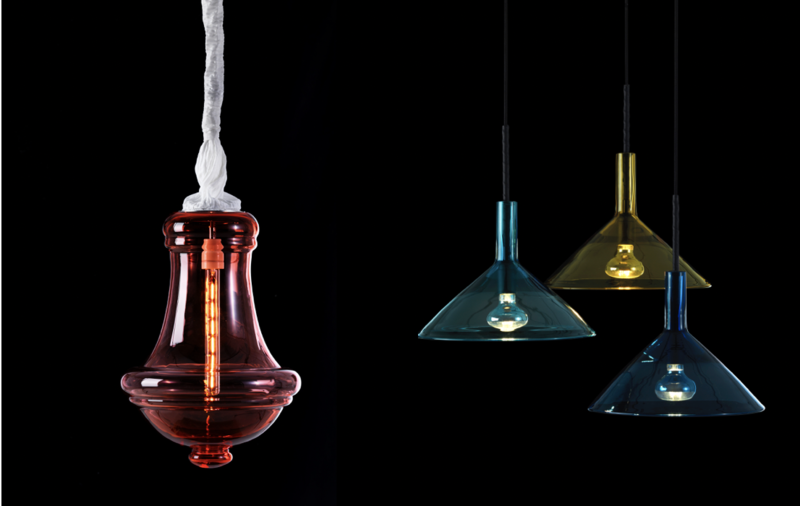 With roots from Småland and close links to the Småland glassworks, the connection to the material glass is easy to understand. The connection between Anna Berglund + Bsweden is also not a coincidence. Take part in the interview with Anna Berglund below and get acquainted with the newcomers Valborg and Tratten. (Hello Anna!) How did the idea of the products come to and what is your source of inspiration? Since my childhood I have been fascinated and attracted by the aesthetics and the visual expression that characterized most of the 19th century and until the time just before the Second World War. I am often inspired by the rich ornamentation, the contrasts of surfaces and materials, as well as the luxuriant richness that prevailed during this time. I have been told by my mother that as a child I often stayed in front of the antique shop's storefront. I was paralyzed by everything from needle pads and lace cloths to silver cutlery and crystal glasses. The diverse variety of expressions has thus appealed to me already at a young age and followed with me ever since. Now in adulthood, I know that this particular century was characterized by broad material knowledge, professional skills and, not least, professional pride. Much time was spent decorating and beautifying both the little and the big. Everything from house façades to kitchen utensils, both in the slightly simpler home of the home and in high-rise environments. Personally, I get inspiration from everything, from all-purpose items to bed-Gustavian style furniture, from the simplest shoemaker lamp to its functional glass screen to the pompous and richly ornamented crystal chandelier. I look backwards to move forward in my own professional practice. How did you and Gunnel meet and what was it that eventually made it a collaboration? I actively searched for Gunnel when I know that her Bsweden cares for material and dares to challenge the prevailing taste codes. Bsweden also prioritizes that production to the greatest possible extent takes place within Sweden, and in the company's absolute vicinity. The glass, which is the largest component of these two new luminaires, is blown on Bergdala Glasbruk and in the master Micke Johansson's cabin in Örsjö. That is, within a radius of max. Four miles. The glass is sanded and post-processed directly at the mill in Bergdala. In this way transports are minimized and the production chain becomes short and intimate, which benefits us all in the long run. Which environments do you want to see the products in and how have the thoughts about color choices gone? The luminaires are intended to work in both a private environment and in a public / commercial environment. Kronan Valborg is preferably happy to act in a group in a shop or in a hotel lobby. The color work is something that has taken place in consultation with Gunnel. They are subdued to their character and will initially be launched in three to four colors. Glass artist and designer with an MFA degree at Konstfack's College for Arts, Crafts and Design at the Department of Ceramics and Glass 2006. Since graduation, Anna has completed a total of 19 projects with art in the public space across Sweden. In 2009, Anna's artwork Crown Jewels of Småland was chosen to represent Sweden in connection with Sweden's Presidency of the EU Council of Ministers. The work is now permanently placed in the Lex building of the Council of Ministers in Brussels. Crown Jewels of Småland is like a big sister to the chandelier we call VALBORG. Valborg is named after Anna's grandmother, who is a great model for Anna. Pink, Gray Blue, Turquoise and Smoke Gray. Valborg diameter 37 cm. Height 52 cm. Suspension comes with about 40 cm. Fabric-clad suspension where the cable inside is provided with a lift. Valborg blåses av Micke Johansson i Örsjö samt mästare Lars Axelsson på Bergdala. Gråblå, Turkosblå, Gulockra, Guldbrun och Nougatgrå. Diameter 34 cm. Glasets höjd 27 cm. Upphäng tillkommer ca 15 cm. The intensity of the colors varies as they are mouth blown in the undercutting technique and the color comes from the tap. The funnel is blown by glassblower master Micke Johansson in Örsjö. The middle tube on Tratten is wrapped with vegetable tanned certified leather from Tärnsjö tannery. Saddler Ingrid Johansson winds and glues with water-based glue. Interested in pictures and press material? All product images are available in high resolution to download during each series. Click on the desired image, in the left corner you will find the arrow symbol for download high resolution image. -The images are used in a context that is perceived positively for the product and Bsweden. -It is clear from the caption that the product comes from Bsweden. We reserve the right to withdraw images.